AllegroMedical.com presents The Komplete Ultimate Meal Replacement Shake . Komplete Ultimate Meal Replacement Shakes deliver superior nutrition on-the-go. Komplete contains 24 fruits and vegetables, a high-level of plant-based proteins and 21 super foods (like acai, mangosteen, black currants, raspberries, green tea extract) with antioxidants, high protein and vitamin rich ingredients to fuel your body with the nutrition it needs. 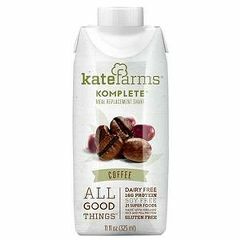 It contains a creamy blend of all-natural ingredients and organic cocoa. Made with organic rice protein. Contains 19gm of rice and pea protein.